#20 Do We Have To Leave? Its that time in the season again to say goodbye to the whales and to Lubec. Everyone is busy cleaning the house and packing up gear. The main office is bare except for the computer that I'm using to write our final blog entry. The only spot in the house that has a normal level activity is the kitchen and that's only because we're having pizza night as our farewell dinner. This year was certainly an anomaly in the Bay of Fundy given the low number of right whales, plus the atypical sightings of sperm whales, pilot whales and white-beaked dolphins. In total, we identified 53 individual right whales (number depending on data analysis) of which there were only 5 mom/calf pairs. We had a successful survey on Roseway Basin and on the way back we found a small aggregation of right whales feeding at the surface southwest of Lurcher Shoals. Colleagues reported small groups of right whales on southern Jeffreys Ledge off Gloucester, MA and around Mount Desert Rock, south of Bar Harbor, ME. These small aggregations spread through out the Gulf of Maine were the trend in 2010. Although we do not have an explanation for the unusual year, we have some theories. Right whale distribution is driven in the spring, summer and fall by feeding; it is likely that the food resource was not sufficient to attract right whales in their usual haunts. We will continue to speak with colleagues in other fields of oceanography and investigate the effects that may result from this anomalous distribution. Sometimes science is hard. The weather for the last two weeks of September were not conducive to any surveys since September 18. Today we learned that one of the whale watch vessels managed to brave the elements in the Bay of Fundy this morning and saw a number of right whales. They also described the wind as strong enough to "trip a snake." 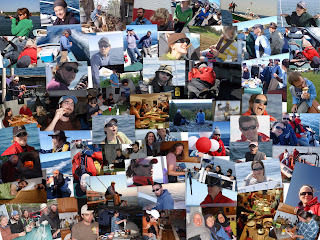 Although our time here is done for the season, we are already preparing for a field season in a portion of the Gulf of Maine called Jordan Basin. This area may be the putative mating ground for the right whale, and vessel surveys are planned for late November and December. Be sure to stay tuned to our blog for the next exciting survey season. Recap and update to entry #17 Where The Whales Aren't. We have ventured to the far reaches of the Bay of Fundy, outside of our traditional survey area, to look for right whales this season. Last week the team discussed expanding our survey to areas south of Grand Manan Island and farther east toward the southern tip of Nova Scotia - 2 areas where right whales have been seen recently. With only a 2 day weather window, we decided to first complete a thorough survey in the Bay before we went exploring around the Gulf of Maine. On September 18, R/V Callisto and Nereid surveyed a large section of the Bay and found 9 right whales in the northeast part of the Bay, an optimistic number given the year. The whales were farther northeast than usual and outside of their typical feeding area. So we extended our Bay of Fundy survey by another day to cover the northeastern and westward areas outside of the critical habitat area. To our surprise, we only found 3 whales between both boats. Interestingly though, we saw 56 pilot whales during those 2 days and similarly to sperm whales, pilot whales are deep-diving squid eaters. Speaking of sperm whales, we saw 5 sperm whales during those surveys and have some cool audio recordings that we're going to post soon. The weather is typical of September and is not looking good for next week but we're hopeful we will be able to survey again before our season ends. #18 To Eat Or Not To Eat? That Is Not The Question. As our field season slowly winds down, discussions of low right whale numbers in the Bay of Fundy continues. A particularly interesting theory has been recently suggested that relates to copepods, the primary food for North Atlantic right whales. A colleague informed us of an unusually warm slug of fresher water that moved into the Gulf of Maine earlier this year. What does warmer water in winter and spring mean for right whales in August - October? Potentially, A LOT! In the Bay of Fundy, right whales feed specifically on a copepod species called Calanus finmarchicus that are found in dense aggregations at or near the bottom of deep water basins in late summer and early fall. The Bay of Fundy is one of the main feeding habitats for North Atlantic right whales so their absence here suggests something may be going on with the food resource on which they have traditionally depended. This brings us back to our original question - how could unusually warm water in winter affect right whales in the summer? In the Bay, adult copepods spawn in late winter, early spring, just in time for the spring phytoplankton bloom. As copepods develop, they feed on the phytoplankton then as summer rolls around they begin a period of hibernation, where they descend to depth and remain there all winter until spring...and the cycle continues (click here for more detail on the copepod life cycle). For now we can only speculate to how the unusually warm water which apparently started to infiltrate in late winter may have affected the spring phytoplankton bloom and/or copepod recruitment. If copepod abundance was lower this year than traditionally found in the Bay of Fundy then the influx of warm water starting earlier this year may provide some insight as to why right whales did not show up in significant numbers. Future detailed monitoring of copepods in the Bay of Fundy would be a big step toward understanding right whale distribution and ecology. Perplexed is a good word to describe the feeling around the whale house these days. It is mid-September and right whale numbers are still unusually low. Below is an e-mail Amy Knowlton sent to the NEAq team last week that expresses our frustrations but also suggests possible reasons for the low numbers we are seeing in the Bay this year. I just checked the database for RW defecation - this August is the only August on record (except for 1984-1993 when perhaps we weren't so careful at documenting this?) that there have been no defecations witnessed in BOF, much less many right whales at all! But it does make one wonder what is up. For those of you not here, we did get out yesterday (Sept 9) and found 3 RW's and 2 sperm whales. One of the RW's (adult male EG#1227) was upcalling and then headpushing and gunshotting (click to hear incredible audio of right whale sound production). Thorny, another adult male EG#1032, seemed to be approaching EG#1227 though they never joined up. The third whale was found around N44 31.0 and W66 32.0 and was booking southwest at a good clip and impossible to work. Several theories have been suggested to explain the low number of whales in the Bay this year. We've discussed in previous blog entries that sperm whale 'clicks' may be driving right whales out of the Bay. Secondly, food resources (copepods) may be limited or even dispersed from the deep water basins which typically aggregate copepods in dense concentrations making feeding more efficient. The lack of observed right whale defecations may suggest insufficient food consumption however it is highly speculative given the overall low frequency of right whale sightings. NEAq team members discuss surveying different right whale habitats outside of the BOF. We were able to survey this past Monday (Sept 13) but only came across two whales (M/C - EG#3360 and 2010CalfOf3360) and they were also heading southwest out of the Bay. 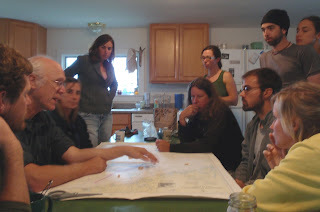 At a team meeting yesterday we discussed moving our survey efforts to areas outside of the Bay where there have been reliable right whale sightings this year. A considerable amount of planning, preparation and cooperative weather is necessary to do this but it will be worth it if we're able to find any sort of right whale aggregations. We'll update asap of any shift in our survey efforts. It should be quite an adventure. On August 29 in Roseway Basin, Yan and I were on watch with our eyes peeled for right whale blows. A few hours had passed and we had not come across any of our whale friends. I spotted something bobbing at the surface about a mile or so away. We decided to head in the direction of the mystery debris. Upon our approach we realized that it was a bunch of balloons. As we were preparing to pull them out of the water, a right whale surfaced only a few hundred feet from us! I quickly radioed down to Moe, "Whale is up, 9 o'clock!!" "What kind?" she asked. I excitedly replied "Right whale!!!" We stayed in the area and happily worked 4 whales, never loosing track of the balloons. As you can see in the photo at the top of this blog, the debris was a bunch of black and white plastic and foil balloons tied together with silver ribbon. The largest of all read "Mr. & Mrs.". I quickly scanned the horizon with my binoculars. My suspicion was right, no wedding party in sight. Where did they come from? I wondered (and still do). I always ask myself that question when I see bits of trash drifting about off shore. Once we had them on deck I punctured each one of them and put them in the trash. When I see stray balloons floating away my stomach cringes because I wonder where they'll end up. Maybe around the neck of a seal, in the stomach of a sea turtle, wrapped tightly around the beak of a bird, or maybe they'll wash up on the shore of your local sandy beach. My balloon story continues onto land. Last week was the annual Eastport/Lubec pirate invasion which includes a water balloon fight between the two sides. Automatically a few fellow right whale team members and I were picking up the colorful bits and pieces of broken balloons that littered the streets. Sadly we could only watch as several water balloons missed their intended pirate targets and landed in the water alongside the harbor seals that play in the tidal currents just a few hundred feet off shore. While writing this blog I began "Googling" words like balloons, animals and ocean. I found this article about marine debris quite interesting. It's incredible how much trash we pass each day we're surveying, and that's only the stuff that floats. I can't even imagine how much is under the surface. Kara, Candace, Yan and Zach loading the Rominic with food and gear before heading out. The crew returned from Roseway Basin around 4 am, last Wednesday morning, after an 18 hour trip of 175 nautical miles. We unloaded the boat under the deck lights, loaded the truck and made our way back to Lubec. As we crossed back into the US from Campobello Island, customs officials asked few questions as our weary faces, blank from exhaustion, showed the effects of 7 consecutive days at sea. Yan and Kara sorting out the data collected for the day. Moe on the satellite phone checking in with the Whale House and getting a weather update. Just after midnight last Wednesday, August 25, the fishing vessel Rominic, fully stocked with food, water, ice and all of our research gear, left the wharf in Wilson's Beach on Campobello Island. The first couple of days were pretty rough due to high seas, moderate wind and no right whales. All of the crew, except Captain Papier, were feeling pretty miserable at the start but by day 2 and 3 everyone had fully adjusted to our new rockin' n rollin' home. Our days started early, between 6 and 7 am, and ended around sunset. Click here to see our daily routine. We had planned to survey from east to west, but on Friday morning we woke up to thick fog. We motored west and broke through into clear skies near the middle of the Basin. We started our survey for whales heading west from the middle of the Basin but only a few right whales were spotted over the first two survey days. After the west side was completed, we motored back during the night to our starting point and were rewarded with an aggregation of right whales on the eastern side. In total, we photographed approximately 30 individual right whales (pending photo analyses) on Roseway Basin. We left on Tuesday morning (August 31). By 9 am the waves were building and the wind increasing, and with the news of an approaching hurricane by the end of the week it was time to steam home. Our trip home proved to be an unexpected surprise as we came across a very active group of whales SW of Lurcher Shoal. In this group we had our only mom/calf pair (Aphrodite/2010Calfof1701) plus a close encounter by the calf, the largest SAG of the trip AND we observed several of the whales subsurface feeding. We were even able to collect a copepod (right whale food) sample to confirm the whales were feeding in this area. Right whale skim feeding at the surface. This whale appeared to be ill - Note the discoloration of the callosities. Other species highlights were bow-riding common dolphins, breaching humpbacks, curious approaches by a minke whale and a blue shark, several leatherback turtles, ocean sunfish, a merlin that flew right in the wheelhouse as we were preparing dinner and a warbler. Although our survey efforts were not rewarded with as many right whale sightings as in past years on Roseway Basin, we did document that the whales are in the area, and that there is a small aggregation at the mouth of the Bay of Fundy. 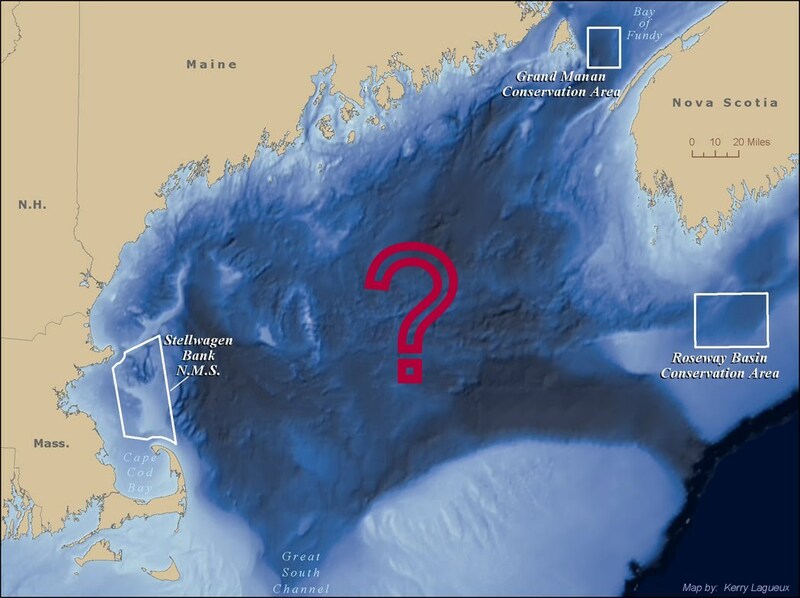 The survey provides another piece to the puzzle of right whale distribution this year, that there seem to be small groups aggregating in several areas around the Gulf of Maine. Despite our initial excitement after our survey on August 27 that suggested the right whales had arrived into the Bay of Fundy after a slow start, it appears that this influx of animals was short-lived. After three days of extensive surveys using two boats on August 29, 30, and 31, only ~17 individuals were sighted. Few of these individuals matched the ~18 whales sighted by the Nereid on August 27 yet the area surveyed over those latter days in August certainly included the area surveyed on the 27th. We are perplexed by the low numbers of right whales and what appears to be substantial movement by individuals in and out of the Bay. Last year during the month of August we saw at least 79 individuals not including calves of the year (data is still in progress). This year we have only had 32 individuals (not including calves) so the change is dramatic. Though we don't know the reason for this reduced number, some ideas have come to mind. First, for the first time ever in our 30 years of surveys here, we appear to have a number of sperm whales sticking around in the Bay - as many as seven individuals were seen on August 29 by our two vessels. Also, whale watch boats in the area have been seeing them throughout the month. When we put our hydrophone in, the sound of clicking sperm whales was quite loud. It could be that right whales do not like this sound (see video below). Audio clip of Sperm whale clicks recorded by Dr. Susan Parks (Environmental Acoustic Program, Penn State University) and her PhD student Jenny Tennenssen (Ecology Program, Penn State University) while on the R/V Callisto. *Note - audio was dubbed to the video for visual effect, clicks can only be heard underwater. Another possibility is that the food resource has not set up well this year and thus, the copepod density is not high enough for the right whales to stick around. We are hoping that Hurricane Earl which passed through the region on Saturday morning could shift things around and entice the right whales back into the Bay. Once the seas and winds calm down, we will be heading back into the Bay to see who we find. 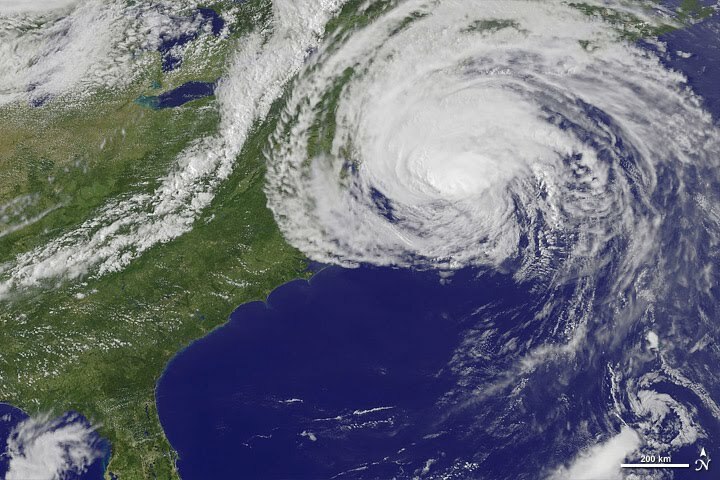 As Hurricane Earl threatened the east coast of the U.S. and the Canadian Maritimes, like most coastal communities, we began preparations for the storm. Starting on Wednesday we began hauling boats (Callisto and Bonita) and on Thursday Amy and I moved the Nereid from our Lubec dock to a safe harbor on Campobello Island, N.B., Canada. By the time Earl arrived it had been downgraded to a tropical storm and arrived Saturday with gusty winds and loads of rain. Fortunately, Earl has moved (but not without first causing the delay of the annual Eastport pirate invasion of Lubec) and we are hopeful that we will soon get some workable weather so that we can resume our surveys of the Bay of Fundy. Waves crash from Earl on the coast of Lubec.